(Left) Jeff Bezos, founder and CEO of the spaceflight company Blue Origin, and Elon Musk (right), founder and CEO of SpaceX, have a sometimes friendly rivalry on Twitter. We think this is the beginning of a beautiful friendship — between two billionaires with their own spaceflight companies. Jeff Bezos, founder of the private spaceflight company Blue Origin, tweeted well wishes to Elon Musk, founder of SpaceX, on the eve of the latter company's maiden launch of its new megarocket, the Falcon Heavy. Musk replied with what might have been a somewhat cold, one-word response ("Thanks"), had it not been followed by an emoji blowing a kiss in Bezos' direction. Bezos' tweet earned a positive response from people on Twitter, who appreciated the show of good sportsmanship. Musk's response, though, has sent spaceflight fans into a bit of a tizzy. Is Musk teasing Bezos, or is this the start of a playful friendship between the two entrepreneurs? The two CEOs have exchanged words on Twitter before, but some of those interactions seemed to have a competitive tone that bordered on hostile, prompting cries of a space rivalry. 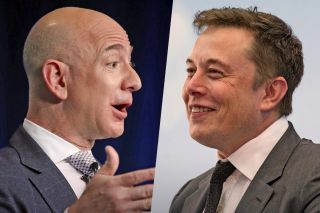 That, in part, has fueled public discussion about the relationship between these two internet billionaires, who actually have quite a bit in common: Both men created their own spaceflight companies as passion projects after making their fortunes elsewhere, and both men have spoken publicly about big visions for humanity's future in space, with Musk eager to colonize Mars and Bezos dreaming of having "millions of people" living and working in space. Both companies have also announced projects that will involve sending cargo or human passengers to the moon. SpaceX is regularly flying payloads on its Falcon 9 rocket, while Blue Origin has yet to fly customers on even its suborbital rocket, New Shepard, although the booster has been demonstrated in test flights and landings. Blue Origin is also working on an orbital rocket called New Glenn, but it is not clear when those will be ready to fly. Clearly, the kind of ambition needed to achieve goals of this magnitude also comes with a competitive spirit.